Pumpkin...it's not just for pie anymore. With Halloween and Thanksgiving around the corner, Endless Simmer decided to take a look at the 100 most creative ways to cook a pumpkin. Pumpkin ice cream? Check. Pumpkin martinis? Double check. Pumpkin whoopie pies? Oh, yeah. Our top ten favorite pumpkin recipes are featured below. 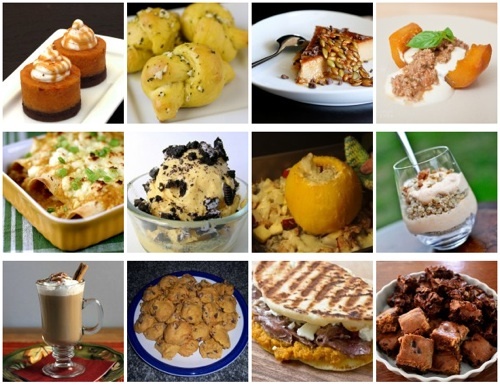 Take a look and vote for your favorite, then check out the full 100 ways to cook a pumpkin. The trendy dessert of the moment gets an autumnal makeover. Read the recipe at <a href="http://www.whatmegansmaking.com/2009/10/pumpkin-whoopie-pies.html" target="_hplink">What Megan's Making</a>. <strong>More</strong>: See all <a href="http://www.endlesssimmer.com/2010/10/14/100-ways-to-cook-a-pumpkin/" target="_hplink">100 ways to cook a pumpkin</a> from Endless Simmer.